There is something magical about stumbling upon good movies or books by accident. Just two days ago I was skipping channels and saw a film that was just starting. The title: Separated at birth. I’m not into action movies that much and anyone who knows me well is going to tell you that I need a couple of months to accumulate my energy before I can watch one again. And yet, when this one crossed my path, I guess I was ready. And besides, this really isn’t your typical action movie. Alfred Hitchcock once famously said “a film should start with an earthquake, and then the stress should continuously increase”. The director of this movie seemed to have taken this saying to heart. It all starts with a young woman – Lucy – waiting to see Elizabeth, a female politician just starting her campaign to become governor. Lucy enters Elizabeth’s office and states she’s her long-lost daughter, kidnapped from her 27 years earlier. They don’t wait too long with taking a DNA tests. And it turns out to be positive. All of things described above played out in the first five minutes of the film. Having over 90 minutes more to fill, I must say I instantly grew anxious to see what happens next, in both meanings of the word. I was so surprised that a story this good could have gone over my head, but it was until I saw on imdb.com that it was made for television. It does make sense to me when I think about it, because as action-packed as it is, there are no spectacular explosions, no foreign locations, and if I recall correctly there were not helicopters involved either. Overall, I would say that the best way to describe this film in three words would be intimate action movie. A good story cannot become great if the characters are bland, flat mannequins. In this department the film doesn’t disappoint either. There is so much that could go wrong between the three leads. There are the aforementioned Lucy and Elizabeth, but another family member is going to play a major role here: Terri, a younger, troublemaking sister, not used to anyone taking her place in the spotlight beside her mother. The dynamics between those three is something absolutely fascinating to observe. As in many other movies like this one you can be sure that none of the characters stay the same all the way throughout the whole thing. That is to say, the plot does some incredible somersaults along the way, and not just once either. At times I needed a good moment to process what just happened before my eyes, and then I had to do that yet again and again. A good story is surprising once, my guys, but an excellent one manages to surprise even more, while still staying fresh and believable. Considering that it’s not spectacular in terms of special effects and yet still manages to give off the vibe of danger, there must be something about this film that does that, right? Of course. And in this case the two elements that do exactly that are the acting and music. 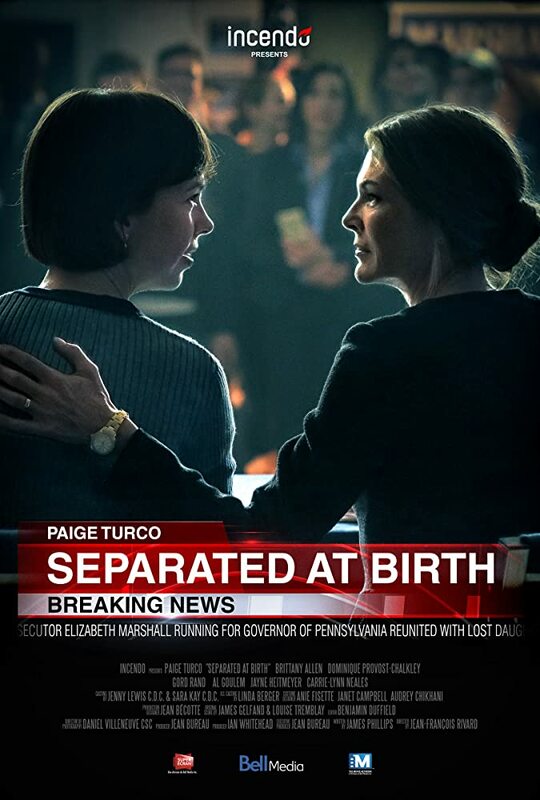 Just as the first two minutes of the film pass, we’re already faced with suspenseful, creepy soundtrack, which is probably going to weed out any viewers who sat down to watch this production hoping for a touching story of mother and daughter finding each other after spending almost thirty years apart. Oh no. No, no, no. When the plot thickens even more, the atmosphere easily translated into music as well – it doesn’t take over the viewer’s entire attention, but it’s setting up the mood perfectly. Now, the acting. To be fair I never heard about any person from the cast before, but just a short googling later I saw that for example Dominique Provost-Chalkley, who portrays Terri, has played in the Netflix show Wynona Earp. Paige Turco, who plays Elizabeth in the film, has one of the leading roles in another Netflix show – The 100. I’m yet to see either of these shows, but now, knowing I would see familiar faces there, I’m more than eager to give both of them a try. Lastly, Brittany Allen, who we have here as our Lucy, have not starred in anything I’ve seen or would watch for the most part – looking at the films she starred in I can see she found herself in the horror genre, and it shows in this film as well. When weird, scary things start happening to her, she skillfully translates the feeling of being trapped and terrified into her acting. Overall I would give this film a strong 9/10. I wasn’t expecting anything out of this experience and got very pleasantly surprised in the end. If you too have a bit under two hours to spare one evening, I would absolutely recommend giving this movie a try.